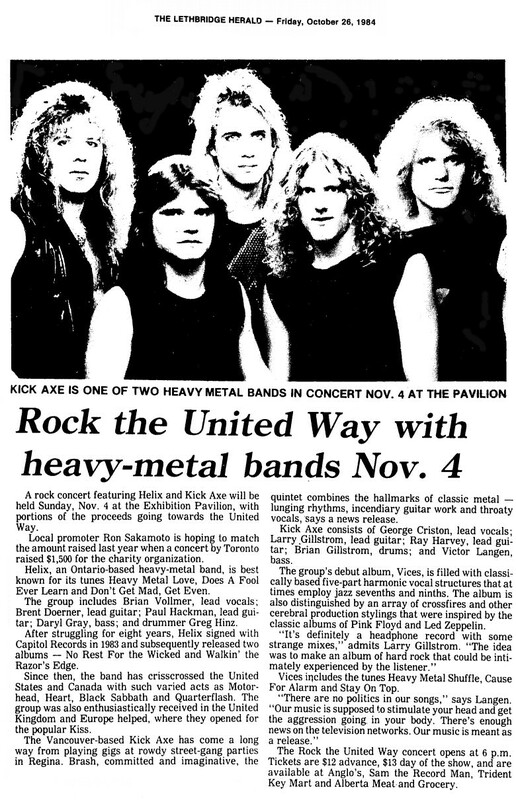 A rock concert featuring Helix and Kick Axe will be held Sunday, Nov. 4 at the Exhibition Pavillion, with portions of the proceeds going towards the United Way. Local promoter Ron Sakamoto is hoping to match the amount raised last year when a concert by Toronto raised $1,500 for the charity organization. Helix, an Ontario-based heavy-metal band, is best known for its tunes Heavy Metal Love, Does A Fool Ever Learn and Don't Get Mad, Get Even. The group includes Brian Vollmer, lead vocals; Brent Doerner, lead guitar; Paul Hackman, lead guitar; Daryl Gray, bass; and drummer Greg Hinz. After struggling for eight years, Helix signed with Capitol Records in 1983 and subsequently released two albums - No Rest For the Wicked and Walkin' the Razor's Edge. Since then, the band has crisscrossed the United States and Canada with such varied acts as Motorhead, Heart, Black Sabbath and Quarterflash. The group was enthusiastically received in the United Kingdom and Europe helped, where they opened for popular Kiss. The Vancouver-based Kick Axe has come a long way from playing gigs at rowdy street-gang parties in Regina. Brash, commited and imaginative, the quintet combines the hallmarks of classic metal - lunging rhythms, incendiary guitar work and throaty vocals, says a news release. Kick Axe consists of: George Criston, lead vocals; Larry Gillstrom, lead guitar; Ray Harvey, lead guitar; Brian Gillstrom, drums; and Victor Langen, bass. The group's debut album, Vices, is filled with classically based five-part harmonic vocal structures that at times employ jazz sevenbts an ninths. The album is also distinguished by an array of crossfires and other cerebral production stylings that were inspired by the classic albums of Pink Floyd and Led Zeppelin. "It's definitely a headphone record with some strange mixes," admits Larry Gillstrom. "The idea was to make an album of hard rock that could be intimately experienced by the listener." Vices includes the tunes Heavy Metal Shuffle, Cause For Alarm and Stay On Top. "There are no politics in our songs," says Langen. "Our music is supposed to stimulate your head and get the aggression going in your body. There's enough news on the television networks. Our music is meant as release." The Rock the United Way concert opens at 6 p.m. Tickets are $12 in advance, $13 day of the show, and are available at Anglo's, Sam the Record Man, Trident Key Mart and Alberta Meat and Grocery.